Gros Michel: The Lost Banana Your Grandfather Loved. 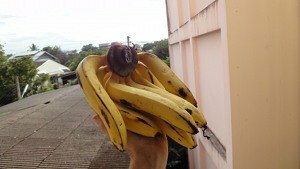 The Gros Michel banana was probably a staple of your grandfather's or great grandfather's diet, but chances are you haven't had the pleasure of a taste. I've been lucky enough to feast on this almost-lost fruit, and in this article I'll tell you a bit about it. Nicknamed Big Mike, the banana was the first to be cultivated on a large scale, and started appearing in North American and European cities in the late 1800s. Yet the monocrop production of the plant doomed it; Panama disease descended and started devastating the plantations where it was primarily grown, and supplies of Big Mike became disrupted in the 1940s. By 1960 no commercial operations were able to grow Gros Michel in the Americas, Caribbean, and many other parts of the world. Almost exclusively in Southeast Asia, where it developed, has it remained disease free and productive on a large scale. Parts of rural Africa, islands in the Pacific and Carribean, and small pockets in Florida, California, and central and south America can still grow the fruit in small farm and garden settups, but large-scale export production has mostly stopped. Wandering around Muang Mai Market in Chiang Mai, Thailand in early 2011, I saw a banana that looked a bit like Cavendish, but not quite. The ripening pattern was different, it was a bigger, and the smell was pleasantly aromatic. The Thai I bought it from called it, "Kluai Hom Thong", one of about 30 banana cultivars grown in the country. Bringing it home, I was pleasantly surprised to taste it. The Thais don't grow many Cavendish and consider them fairly bland, although I have seen them in markets occasionally. Although Big Mike doesn't compare to my favorites like apple bananas (Manzano) or Nam Wa bananas, they're still much better than the Cavendish. The taste is considerably sweeter, and the consistency much creamier, with extremely narrow "seed areas" that you can see, but only vaguely taste. I should note that you do occasionally see something labeled Gros Michel in US supermarkets. They aren't the same thing, and don't taste any different than Cavendish. Learn how a fruit like Gros Michel fits eat a healthy raw food diet. Find more interesting fruits you may not have tried here. Save money buying the large amouts of fruit you need to be healthy.